Orthoceras fossils for sale come in a great many sizes, styles, and uses. Moroccan craftsmen create stoneware, bookends, plaques, and sculptures to show off these fossils. You can also buy polished orthoceras as jewelry or in several sizes as single specimens. The animals that created these fossils really inspire the imagination. They were fearsome hunters. Their head grew tentacles and they had a sharp beak in the center of their mouth. The crystallized chambers make a bright contrast to the dark black or brown matrix that surrounds the fossil. This limestone matrix is literally filled with fossils. Orthoceras is a common name for all species of straight shelled nautiloids. The shell is the part of these animals that fossilizes. They are part of the mollusk phylum called cephalopods. The cephalopods are an ancient group of animals dating back to the Ordovician Period some 450 million years ago. 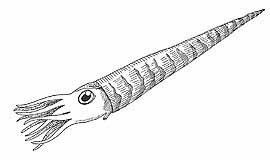 Related to today's squid and octopus, the orthoceras was one of the first of this group. They thrived in shallow seas all over the world during the Paleozoic Era and into the Triassic Period before finally going extinct. The name means straight horn. These shells could range in size from about a centimeter to over 14 feet! They had tentacled heads coming out of a cone shaped shell. As the animal grew they added on to their shell and moved out into the new part. They created a wall called a septa to close off the old part. A tube called a siphuncle connected all of the old sections. The siphuncle was used to adjust the bouyancy of the shell. By filling the old chambers with gas they could rise in the water table. If they wanted to move lower they would fill the chambers with water. Like all of the cephalopods orthoceras was a predator. The ability to change depth allowed them to find the best hunting grounds.